You can buy scrapbooking paper that shimmers like a pearl. Cut 12 gates out of this white pearl paper. (You can also use regular white paper.) There are 3 doors on each side of the city, and since each door is a pearl, they need to be slightly rounded at the edges. For the throne, you can form a chair out of white self-hardening clay. Let it dry overnight. Then spray paint it gold. For the city buildings, I used small wooden blocks from a craft store. I used wood glue to connect two blocks together for the taller buildings. I spray painted those gold. For the river, I cut shimmering blue scrapbooking paper in a wavy line, the width of the throne. I lay that on top of the mirror. The streets of the city are pure gold–transparent–which is why I used a mirror. I bought toy railroad trees, which I interspersed around the city, with the most important tree coming out of the river. This is the Tree of Life, whose leaves bring healing to the nations. 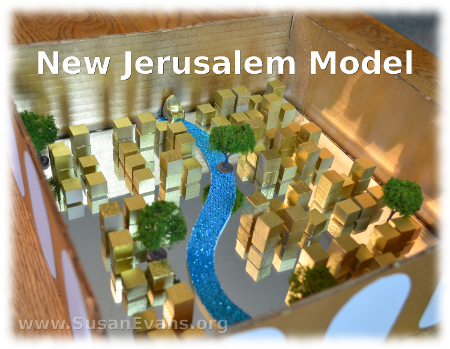 The video tutorial for this New Jerusalem model will be in the Unit Study Treasure Vault, where I have a gigantic Bible section. 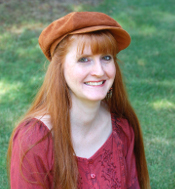 God has given me limitless creative ideas for how to teach the Word of God to children, and He prompted me to start the Unit Study Treasure Vault for homeschoolers. But anybody can join. 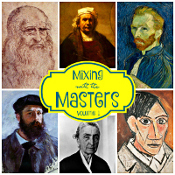 It contains thousands of hands-on learning activities, and I add new exclusive videos every month! This entry was posted on Thursday, October 31st, 2013 at 8:00 am	and is filed under Bible. You can follow any responses to this entry through the RSS 2.0 feed. You can skip to the end and leave a response. Pinging is currently not allowed. You have the best ideas! My 6 year old even came to look at your picture and when I explained to him what it was he said, “Let’s do that!” 🙂 Another pinnable post! Thank you, Susan! How great that your son is excited about spiritual things!